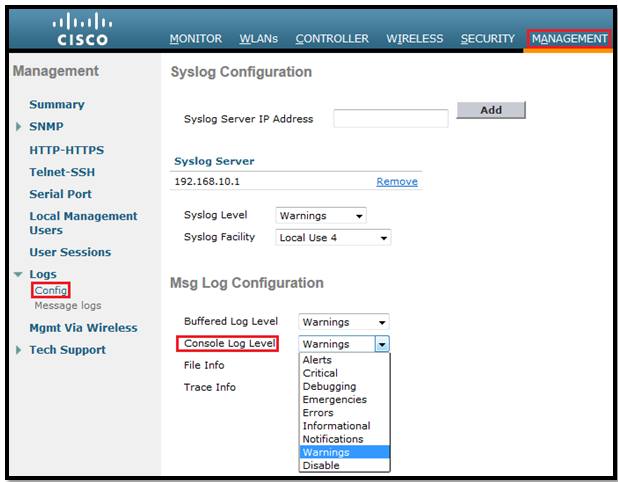 In this post we will learn how to configure WLC for logging option. Logs are always good to have while troubleshooting any issue. Console logging: By default, the devices send all log messages to its console port. Hence only the users that are physically connected to the router console port can view these messages. Buffered logging: This type of logging uses device RAM for storing log messages. Buffer has a fixed size to ensure that the log will not deplete valuable system memory. Syslog Server logging: The device can use syslog to forward log messages to external syslog servers for storage. This type of logging is not enabled by default. SNMP trap logging: The device is able to use SNMP traps to send log messages to an external SNMP server. Screenshot from WLC: Management > Logs > Config. 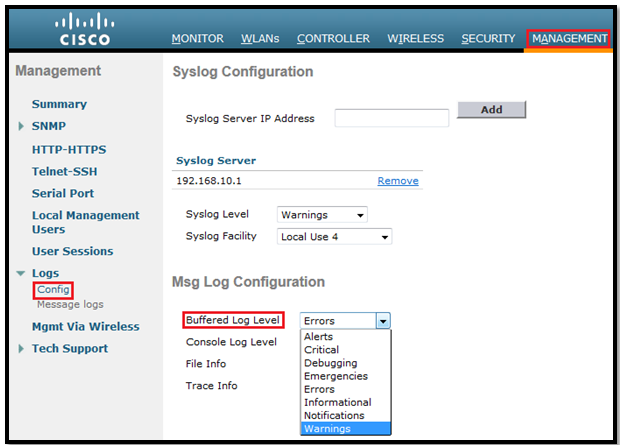 To configure syslog in cisco WLC we have to go Management > Logs > Config option. Put the IP of the syslog host where we want to send it and click on Add. Then select the syslog level from drop down box. Select the Syslog facility from drop down box. *** If we set a syslog level, only those messages whose severity is equal to or less than that level are sent to the syslog server. *** After code 5.x, it’s possible to send the logging to multiple syslog servers. (WLAN1) >config logging syslog ? facility       Set facility for outgoing syslog mesages to remote host. host           Configure remote hosts for sending syslog mesages. level          Set severity level for filtering syslog mesages to remote host. tls            Configure sending syslog messages over tls. (WLAN1) >config logging syslog host ? <A.B.C.D>      dotted IP address of the remote host. (WLAN1) >config logging syslog facility ? (WLAN1) >config logging syslog facility local? (WLAN1) >config logging syslog level ? <0-7>          Set syslog message logging message severity level. alerts         Set syslog message logging severity to 'alerts' (severity 1). critical       Set syslog message logging severity to 'critical' (severity 2). debugging      Set syslog message logging severity to 'debugging' (severity 7). emergencies    Set syslog message logging severity to 'emergencies' (severity 0). errors         Set syslog message logging severity to 'errors' (severity 3). informational  Set syslog message logging severity to 'informational' (severity 6). notifications  Set syslog message logging severity to 'notifications' (severity 5). warnings       Set syslog message logging severity to 'warnings' (severity 4). (WLAN1) >config logging syslog tls ? enable         Enable logging message to syslog over tls. disable        Disable logging message to syslog over tls. ***Note: When we are configuring syslogs for APs, it is always recommended to do it after the APs have joined up to the WLCs to ensure that they get the configurations. Syslog configuration for APs via WLC CLI interface. (WLAN1) >config ap syslog host ? specific       Configures the system logging host for a specific Cisco AP. (WLAN1) >config ap syslog host specific ? <ap-name>      Specify the name of the specific Cisco AP. (WLAN1) >config ap syslog host specific AP001 ? (WLAN1) >config ap logging ? syslog         Set Ap logging syslog level. (WLAN1) >config ap logging syslog ? (WLAN1) >config ap logging syslog level ? alerts         Logging severity level 1.
critical       Logging severity level 2.
debugging      Logging severity level 7.
emergencies    Logging severity level 0.
errors         Logging severity level 3.
informational  Logging severity level 6.
notifications  Logging severity level 5.
warnings       Logging severity level 4. (WLAN1) >config ap logging syslog level warnings ? <Cisco AP>     Enter the name of the Cisco AP. all            Applies the settings to all APs. (WLAN1) >config ap logging syslog facility ? 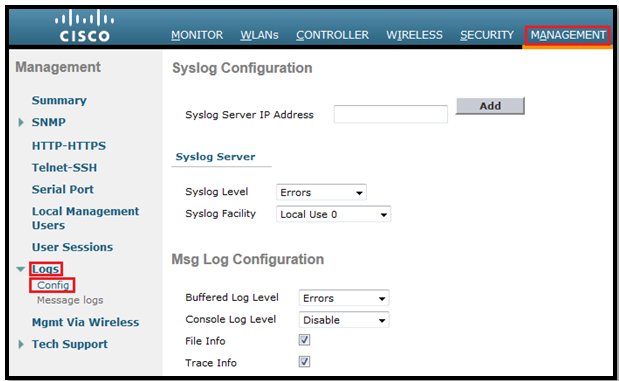 (WLAN1) >config ap logging syslog facility lo? 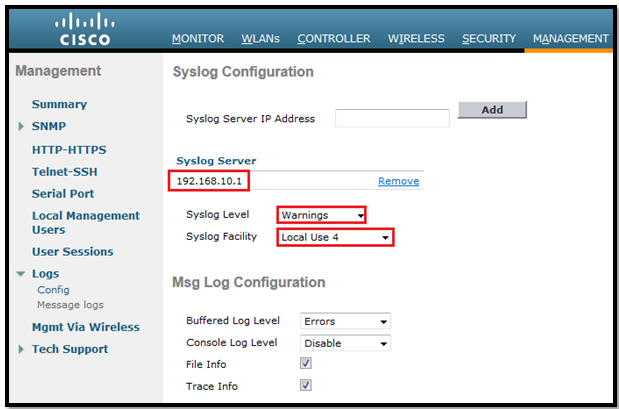 (WLAN1) >config ap logging syslog facility loc? (WLAN1) >config ap logging syslog facility local4 ? (WLAN1) >config logging buffered ? <0-7>          Set buffer logging message severity level. alerts         Set buffer logging severity to 'alerts' (severity 1). critical       Set buffer logging severity to 'critical' (severity 2). debugging      Set buffer logging severity to 'debugging' (severity 7). emergencies    Set buffer logging severity to 'emergencies' (severity 0). errors         Set buffer logging severity to 'errors' (severity 3). informational  Set buffer logging severity to 'informational' (severity 6). notifications  Set buffer logging severity to 'notifications' (severity 5). warnings       Set buffer logging severity to 'warnings' (severity 4). (WLAN1) >config logging console ? <0-7>          Set console logging message severity level. alerts         Set console logging severity to 'alerts' (severity 1). critical       Set console logging severity to 'critical' (severity 2). debugging      Set console logging severity to 'debugging' (severity 7). emergencies    Set console logging severity to 'emergencies' (severity 0). errors         Set console logging severity to 'errors' (severity 3). informational  Set console logging severity to 'informational' (severity 6). notifications  Set console logging severity to 'notifications' (severity 5). warnings       Set console logging severity to 'warnings' (severity 4).